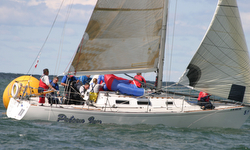 (Detroit, MI)- A J/35 owner in Detroit, MI- Dean Fitzpatrick- is organizing an offshore racing clinic for just 20 people this May 2019. It is a six lesson program, five hours per day, that will teach wanna-be offshore racers how to rig, sail, and race one of the most iconic offshore racing sailboats ever designed- the J/35. Detroit has some of the best offshore sailors in the USA that are going to volunteer their J/35s and time. The boats are WHIPLASH, DEAN’S LIST, FALCON, and BLACKHAWK. On the last day of the clinic- May 19th- there will be W/L races against several J/35s from the local fleet to test everyone’s knowledge and skills. A candidate must be at least 18 years old and know how to swim. The program is open to ANYONE that wishes to learn how to sail offshore. The six-day, five hours per day, program cost is $1,000. But, you will get ALL your money back IF you race five races on any J/35 (or similar big boat) between May and September 2019. Please call Dean Fitzpatrick to lock in your enrollment, it just might be the best move you ever made! Call Dean at ph# (989) 305-2985 or (248) 790-0666. Or, email him at- dean_fitzpatrick@msn.com Add to Flipboard Magazine.